The all new 2014 Diamondback Airen 2 is a racing bicycle which has been specifically designed for women. Designed with Diamondback’s EPG (Enhanced Performance Geometry) for women, this bike can be used for racing, club or weekend rides, exercising or commuting. The aluminium frameset of this bike makes it light as well as strong. The ride quality offered is extremely smooth and delectable. The Enhanced Performance Geometry for women offers perfect fit and a comfortable ride experience coupled with speed and high-performance. The bike comes with Shimano 105 shifters which have a proven track record of excellence and provides smooth, efficient and seamless shifting. Tektro R540 Series Dual Pivot Brakes provide shear braking force with precision, stability and control. It can be your perfect companion on weekend or club rides. Riding this one is immense fun and it is also suitable to be used as a commuter. The rakish looks of the bike are equally impressive as its performance and the price tag associated with this bike makes it quite a bargain. DBR Podium Performance Carbon Fork with Alloy Steerer; FSA Omega Cranks with Compact MegaEXO N10 50,34t 10 spd rings; Sealed Cartridge Bottom Bracket; Shimano 105 Front Derailleur; Shimano 105 Rear Derailleur (10-spd); Shimano 105 Dual Control Shifter (10-spd); Shimano 105 Dual Control Brake Levers; Tektro R540 Dual Control Pivot Brakes; Shimano CS-4600 Series Tiagra Cassette (12-30t, 10spd); DB Equation R 23 millimetre Rims (28H Front and Rear); Michelin Dynamic Sport Tires (700x23C); Wellgo Road Pedals with Toe Clips and Straps; DBR Drop-bar Road Handlebar; DB Devine Series Road Stem (+- 7o); DB Devine Series Seatpost with Micro-adjust Feature (27.2 millimetre); DBR Performance Women’s Road Seat; “Cane Creek” Size Integrated Drop-in ACB 1-1/8th Headset; FSA CN910 10 spd Chain; 14g Stainless Steel Spokes and DBR Cork Grips. The Airen 2 is a racing bicycle for women by Diamondback. 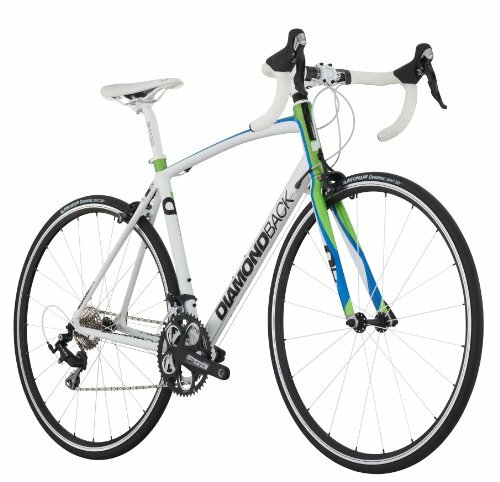 This bike comes with an aluminium frame with Diamondback’s Enhanced Performance Geometry design. The frame does two jobs: first, it keeps the bike’s weight in check and makes it light and strong; second, its unique design makes the bike extremely comfortable to ride. The bike comes with a Shimano components equipped drive train which performs quite well. The Shimano 105 shifters live up to their usual standards and provide seamless gear shifting. The Tektro R540 brakes function well and provide ample braking power with superior control and stability. The bike comes with a carbon fork which absorbs the unexpected hits and bumps off the road and offers a smooth ride quality. This bike’s overall performance is great and as a racing bicycle, it has the capability of going quite fast. As a commuter bike, it offers a smooth and fun ride experience with reliability and endurance. 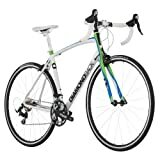 The bike is available at a more than reasonable price and if you are looking for a racing bike which offers to you a complete package of speed, agility and reliability coupled with high performance, stylish looks and a comfortable ride experience, this bike can definitely be considered as an option.